PRODUCT: OMG #USD14, Olyflow 14 x 14 x 4 inch Universal Drain Strainer / Strainer Dome. Heavy Duty Aluminum with Stainless Steel Mounting Hardware. Price/Each. DESCRIPTION: Engineered to replace broken or missing drain strainers. The domes are oversized (available in 10", 14", 18" & 24" diameters) to insure the retrofit of all existing drain bowl assemblies and to increase drain protection by spreading rooftop debris over a larger area. 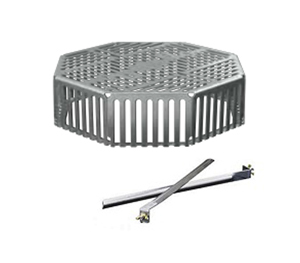 Securement to the existing drain assembly is accomplished with two adjustable tension arms or in an optional vandal resistant design. Constructed of .080" thick aluminum with stainless steel hardware. Unique low profile design (4" HIGH) . Two adjustable 14" long tension arms to secure the Universal Strainer Dome to the existing leader pipe. Ideal for maintenance work or reroofing projects where existing drain bowls are being reworked and strainers are missing. Sizes: 10, 14, 18 and 24 inch diameters.